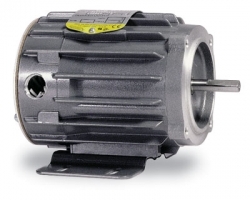 An electric motor converts electrical energy into mechanical energy. Electric motors operate through interacting magnetic fields and current-carrying conductors to generate force, although a few use electrostatic forces. The reverse process, producing electrical energy from mechanical energy, is accomplished by an alternator, generator or dynamo. Many types of electric motors can be run as generators, and vice versa. For example a starter/generator for a gas turbine or Traction motors used on vehicles often perform both tasks.